Item #CH-739-DER-E441: Rhodium-Plated Sterling Silver Southern Gates Collection 10mm southern oak tree stud earrings with post backs. 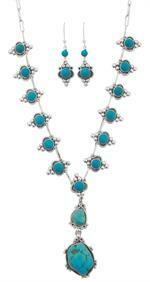 Item #ELY-89012: 17" Sterling Silver Turquoise necklace and earrings set with two 4mm round Turquoise beads, fifteen 6mm round and two freeform Turquoise cabs (earrings have shepherd's hooks). Item #QG-SFL-55: 20" Sterling Silver Snowflake necklace and earrings with post backs. Item #CH-739-DER-E541: Sterling Silver Southern Gates 20mm round art-deco design earrings with shepherd's hooks. Item #CH-740-DER-E504: Sterling Silver Southern Gates Collection 20mm holiday heart tree earrings with shepherd's hooks. Item #CH-739-DER-E551: 20mm Sterling Silver Southern Gates pumpkin earrings with shepherd's hooks. 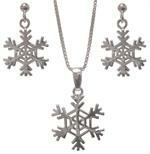 Item #CH-E518: 20mm Sterling Silver Southern Gates snowflake earrings with shepherd's hooks. Item #QG-QE3937: Sterling Silver circle disc dangle earrings with shepherd's hooks. Item #CH-DER-E508: 24mm Sterling Silver Southern Gates oblong heart earrings with shepherd's hooks. Item #CH-E363: 25x30mm Sterling Silver Southern Gates scroll design teardrop dangle earrings with post backs. Item #CH-739-DER-E516: 30x6mm Rhodium-plated Sterling Silver Southern Gates balcony drop earrings with shepherd's hooks. Item #SD-ER-75: Set of four pairs of Sterling Silver dangle earrings with each set containing one pair each of 9mm round Amethyst, Sky Blue Topaz, Prasiolite and Smoky Quartz with shepherds hooks. 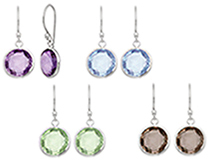 Item #SD-0545: Set of five pairs of Sterling Silver earrings with each set containing one pair each of 5mm round Amethyst, Sky Blue Topaz, Golden Citrine, Garnet and Peridot with post backs. Item #IGM-ABS-E-12: Sterling Silver 12mm round earrings with Abalone Shell and post backs. Item #IGM-GNT-E36: Sterling Silver earrings with two 3mm round and two 11x9mm oval Almandite Garnet and shepherd's hooks. Item #SC-EPFA-0881-X1: Rhodium-plated Sterling Silver & Vermeil Earrings with two 5mm round Amethyst of .83 Cts. TW. Post backs. Item #SC-EPFA-1321-X1: Rhodium-plated Sterling Silver Earrings with two prong set 3mm round Amethyst of .20 Cts. TW; Post backs. Item #SC-EPFA-0706-X1: Rhodium-plated Sterling Silver Earrings with two 6mm square Amethyst of 1.91 Cts. TW; Post backs. Item #SC-EPFA-0939-X1: Rhodium-plated Sterling Silver Earrings with two 6x9mm Amethyst Briolettes of 4.06 Cts. TW; Post backs. Item #RON-1718: Sterling Silver earrings with checkerboard faceted 8mm round Amethysts and post backs. Item #CJ-AM-ER-25: Sterling Silver Earrings with two checkerboard faceted 6mm round Amethyst; Post backs. Item #SC-EGFA-0226-X1: Rhodium-plated Sterling Silver Hinged Hoop Earrings with two bezel set 4mm square Amethyst of .60 Cts. TW; Top wires. Item #QG-QE3433: Sterling Silver antique filigree yin and yang dangle earrings with shepherd's hooks. Item #QG-QE3434: Sterling Silver antique oval yin and yang dangle earrings with shepherd's hooks.